Educational and institutional buildings are particularly sensitive to scheduling of repair or restoration work to minimize disruptions to normal facility operations. 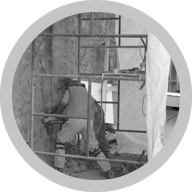 Polycrete has established a reputation for being able to accommodate the restrictions on work hours, noise, product odour and dust that occur during most construction activities. Typical repairs completed include repair or replacement of deteriorated concrete and reinforcing steel, repair of leaking cracks through concrete by epoxy pressure injection, repair or strengthening of structural wood components and glulam beams, repair of construction joints and installation of expansion joints, concrete strengthening using carbon fibre external reinforcement, waterproofing of parking or plaza decks.